Cleverly designed and packed with the best podiatry tools, ZOHL pedicure set is what you need to remove ingrown nails effectively and with less pain. It is crafted in Germany from strong hot forged stainless steel and keeps the instruments sharp and precise for decades with proper care. Included are the toenail clipper for ingrown nails with slim, pointy and straight edges so you can access between the nail and the skin with delicate ease. 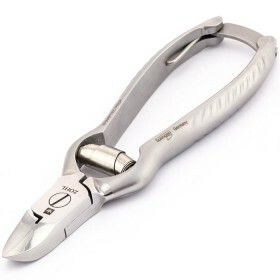 Ingrown toenail lifter features flat tips - one straight and one bent for convenient lifting of the nail before trimming the ingrown nail. 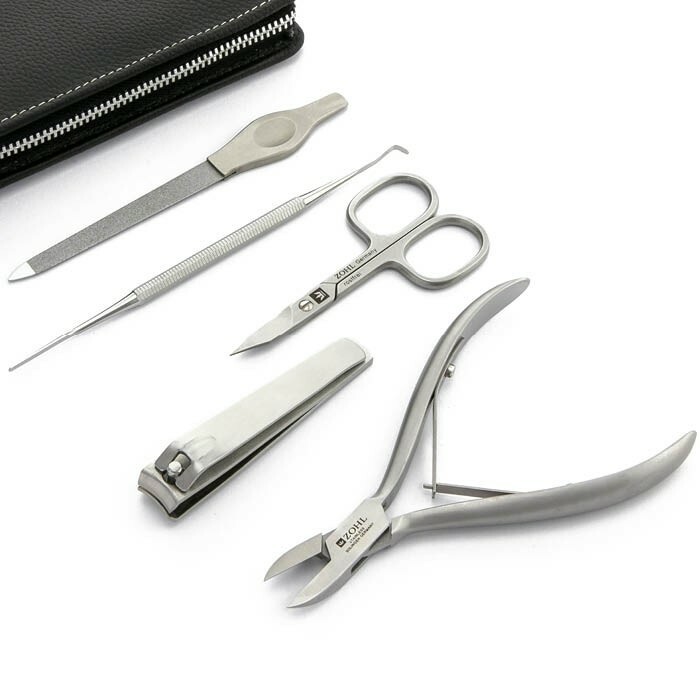 The set also includes pointy nail scissors, nail file and large nail clipper, all beautifully presented in a black leather case with a metal zipper. It is a perfect gift for anyone who suffers from ingrwoing nails and want the best and most effective tools to keep their nails in tip top shape. 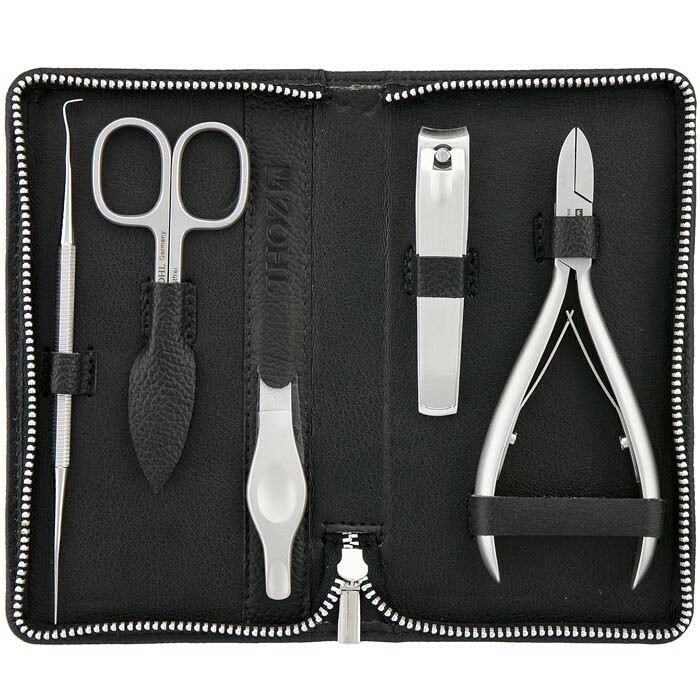 Zohl Classic Pedicure Set is the best and highest quality nail set with professional podiatry tools for removing ingrown toenails. It is crafted by hand in Germany where the best and most durable cutlery is made, to give you decades of impeccable and reliable service when looking after ingrown nails. 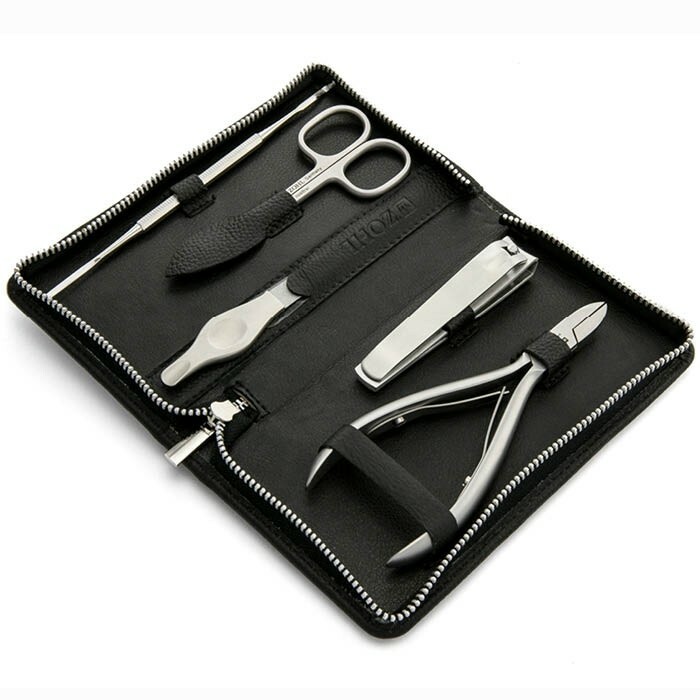 Like all manciure and pedicure sets by ZOHL, this set contains high quality, sharp and precise nail care tools, making removal of ingrown nails an easier and less painful task. Rust proof, strong grade surgical stainless steel ensures the cutting edge stays sharp for decades despite of regular use, allowing a precise cut even in tights areas between the nail and the skin. The tools are easily sterilisable and can be disinfected with the most common disinfectants to prevent nasty bacteria or fungus spread. 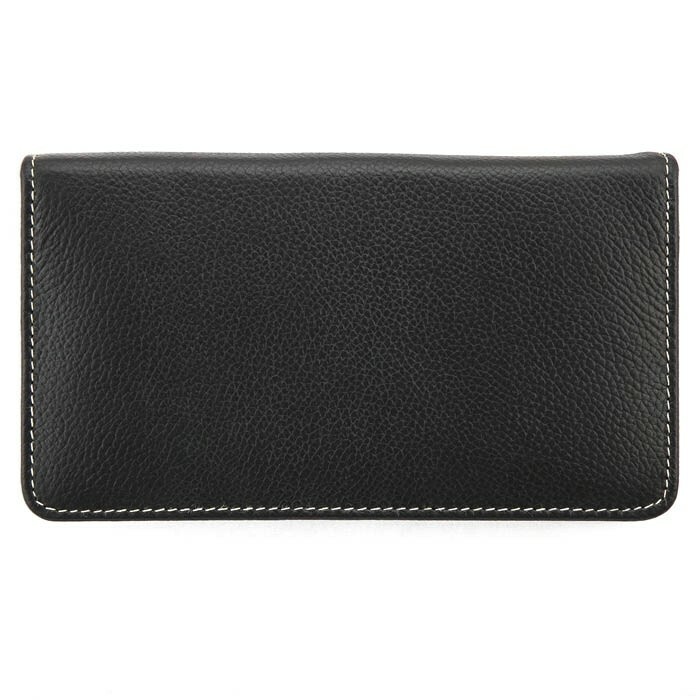 Classic black case is made of genuine leather with a sturdy metal zipper and secures the instruments in their place, to prevent blades from damage and dirt. Double Sided Nail File (13 cm) with stainless steel ergonomic handle for comfortable handling. 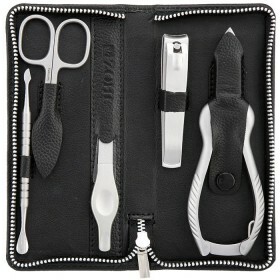 The file features an incorporated cuticle pusher on one side and pointy tip on the other side for cleaning under nails. The blade itself has sufficient amount of chromium which holds the abrasive particles together and ensures a long lasting service, even when used on very thick nails. Pointy Manicure Scissors (9cm), slightly curved and suitable for trimming fingernails, hangnails and overgrown cuticles in the nail beds. 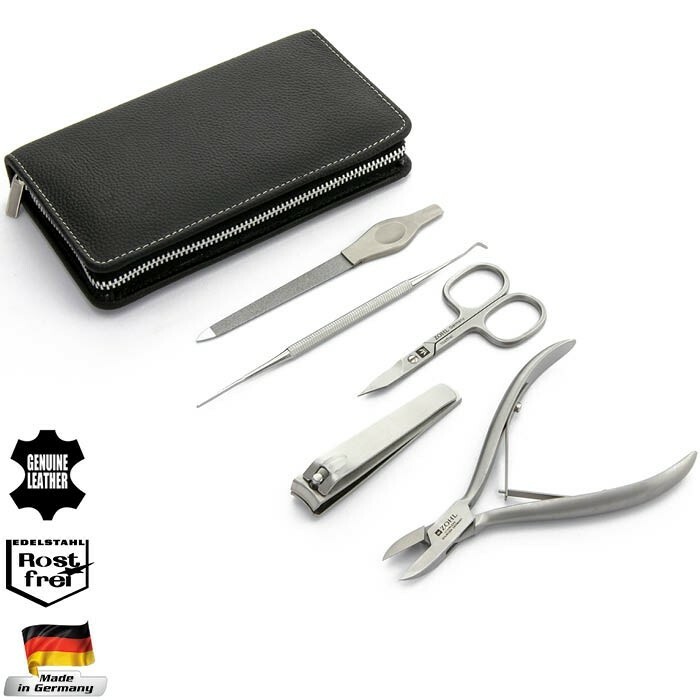 Made by the experts in the best manciure and pedicure instruments, this Zohl set represents the best German craftsmanship that will delight with quality for the best presesntation of your fingernails and toenaiils. Great idea for gift giving, too. Case measurement (closed):16 x 9 x 2 cm.